It doesn't have to be stolen; because it takes just seconds for a hacker to slip a USB stick into a laptop when it is unattended to install malicious software or steal data. Even relatively unsophisticated hackers can run programs like Mailpassview from a USB stick to steal your email account details and email password. An account password is an effective first line of defence, but only if you avoid choosing a commonly used - and therefore easily guessed - password. An analysis of passwords stolen from websites during recent security incidents reveals that the most common include "password", "123456", "abc123", "qwerty" and, bizarrely, "monkey". It's easy to change or remove an account password using a free resetting program such as pogostick, or to guess a short one using a "bruteforce guessing" program such as Ophcrack. 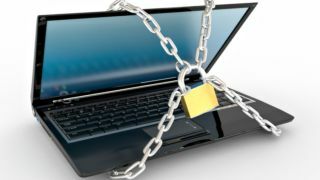 But running these involves booting the computer from a CD or USB stick, so you can increase security by disabling the ability to boot from one of these devices. This can be done by altering the settings in your laptop's basic input/output system (BIOS) – the built-in software with generic code to control the machine – which can usually be accessed by pressing F1, F4, F10 or Del just after you switch it on. The best way to prevent this is to encrypt your laptop's hard drives. Encrypted drives can only be accessed after the encryption key is supplied - usually in the form of a PIN, a password or by inserting a USB stick containing the key. If you don't have access to a company VPN, you can use one from service provider such as StreamVia or StrongVPN. This ensures your data is encrypted and protected from other users of the public local network.